One of the most important aspects of any animal-based agricultural operation is having an effective waste management plan which reaps the benefits and helps reduce the risks associated with the use and disposal of animal wastes. Improper manure management can have a detrimental effect on water quality. Manure management regulations are created and enforced by federal, provincial, state, and local authorities in an attempt to minimize water pollution. Good manure management will also ensure that you get the maximum benefit from the nutrients in the manure. 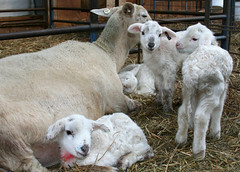 If sheep and/or lambs spend any part of the year in barns, stalls, pens, loafing areas, or feeding areas, you will need to deal with manure from those areas. Manure is not just the urine and feces from livestock, but also the bedding, runoff, spilled feed, and anything else mixed with it. A complete manure management system involves collection, storage (temporary or long-term) and ultimate disposal or utilization. If your sheep produce more manure than you can use on your land, you need to develop ways to sell the manure or give it away. Manure production varies with breed and feeding levels. 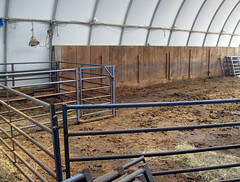 The amount of bedding to be handled with the manure depends on the housing system selected. 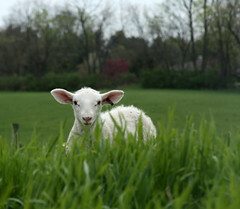 A market lamb weighing about 100 lbs produces 4 lbs of manure daily, the equivalent of about 0.06 cubic feet per day. About 0.65 cubic foot per day of storage is needed for each 1,000 pounds of live sheep, or about 40 pounds of manure per day. Manure contains valuable nutrients, like nitrogen (N), phosphorus (P), and potassium (K). In addition to the three major elements, manure also contains essential micro-nutrients (boron, calcium, copper, iron, magnesium, manganese, molybednum, sulfer, and zinc. Manure nutrients come from the feed that the animals have eaten. Anywhere from 75 to 90 percent of the plant nutrients fed to animals are excreted in their manure, so it should be no surprise that the stuff is an excellent fertilizer. The level of protein and inorganic salts in feed (sodium, calcium, potassium, magnesium, phosphate, and chloride) will be reflected in the characteristics of the manure. The amount of nutrients depends on the type of animal and the way the manure is handled. 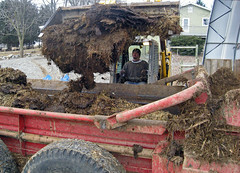 Manure than contains a lot of bedding will contain fewer nutrients than pure manure. The nutrients in manure are a mixture of inorganic and organic forms. The inorganic forms are similar to those in commercial fertilizer. They dissolve in water and plants can use them right away. The organic forms come from the remains of plant tissue, cells, and bacteria that are in the manure. They are slow-release nutrients that the plants cannot use right way. They become available to the plants as the manure decays. The organic matter in manure is also valuable because it makes soil easier to manage, less likely to erode, and more likely to absorb water. Regular manure application lowers soil pH. The acidifying effect of manure is less than that of inorganic fertilizers. Land application is the most effective and economical way to utilize solid manure, so long as the manure is not applied to sloping ground, frozen land, or on slopes near ditches, streams, and roads. 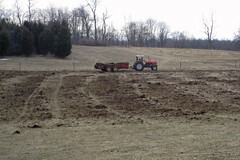 To get the most value from your manure, you should apply it close to planting time. Applying manure at this time makes it less likely you will lose nutrient to leaching or runoff. For any field larger than a garden, a manure spreader is a great timesaver. 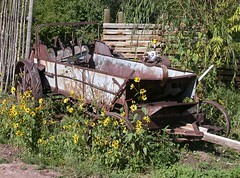 Manure spreaders vary in size. By calibrating your manure spreader, you can get a good idea of how much manure you are applying. The simplest method to calibrate a manure spreader is to spread tarps on he ground and weigh the amount of manure that falls on each tarp as the manure spreader passes over it. Storage of livestock wastes and wastewater involves accumulating manure in an environmentally sound manner until they can be applied to land or otherwise utilized. Manure storage facilities allow farmers to spread manure when the conditions are right for nutrient use by crops. 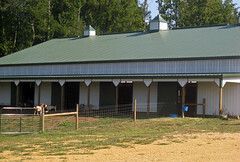 The ideal storage site for solid manure is a roofed shed with an impermeable floor (e.g. concrete). 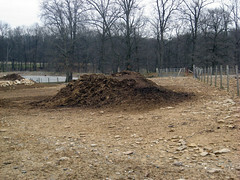 Dry manure can be stored in solid form in stockpiles; however, the piles should be covered. Obviously, manure storage structures or sites should be located to minimize odour nuisance to neighbours. Composting is "the breakdown of manure (by micro-organisms) under controlled and managed systems to produce a beneficial end-product (compost)". Fresh manure may contain pathogens and should not be spread on land that produces crops that are eaten raw (e.g. carrots, strawberries, lettuce, and greens). 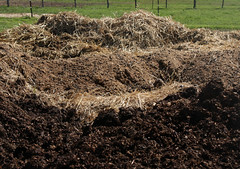 E. coli, salmonella, parasites, hormones, and other pathogens contained in manure can be reduced by proper composting. 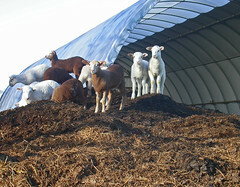 Composting reduces manure volume by approximately 50 percent. It reduces odors and kills weed seeds and fly larvae. Methane emissions can be reduced by a well designed composting process. Making good compost depends on having the proper source of nutrients with a balance of carbon and nitrogen, keeping the pile of compost moist, and making sure that there is adequate aeration. The ratio of carbon to nitrogen is critical to the composting process. While composting can occur over a wide range. The ideal ratio is about 30 parts carbon to 1 part nitrogen. Products from animals, such as manure, are too high in nitrogen for efficient composting. Products from plants, such as leaves, wood, or paper, are too high in carbon. The composting process can proceed by mixing animal and plant products together. Compost should be maintained at temperatures of 130-149° F (55-60 degrees°C) for a period of several days, if possible up to two weeks. Composting can be done in bins or windrows (long open piles). Turning the compost pile will keep it aerated and speed up the compostingprocess. Organic wastes typically take several months to a year to compost in a compost pile. The Federal Clean Water Act provided the mechansim to regulate industries that have a potential to discharge pollutants into waterways. By confining animals to areas or lots, farmers and ranchers can efficiently feed and maintain livestock. But these confined areas become major sources of animal waste. Large animal feeding operations are required to have a permit to operate. An operation is an Animal Feeding Operation (AFO) if animals are confined at least 45 days in a 12 month period and there is no grass or vegetation in the confinement area during the normal growing season. The operation is is a Confined Animal Feeding Operation (CAFO), if it meets the definition of a AFO and meets one of the following CAFO definitions. The operation is a large CAFO if it has at least 1,000 animal units (AU). That would be 10,000 sheep and lambs. The operation is a medium CAFO, if a manmade ditch or pipe carries manure or wastewater from the operation to surface water or the animals come into contact with surface water running through the area where they are confined. Medium CAFO's have at least 300 AU, which would be 3,000 sheep and lambs. No matter what size the operation is, it may be designated a CAFO if the permitting authority inspects the operation and finds that it is adding pollutants to surface water. If the operation is a CAFO, the operator must apply for a permit. Most states have the authority to manage CAFO programs and issue permits. The permit will require you to control pollutants at your operation and keep them from getting into surface waters. 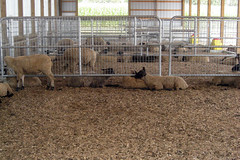 Click HERE to read about the federal requirements for sheep CAFO's. Some states have enacted laws which expand federal regulations. For example, nutrient management laws in Maryland require anyone with 8 or more animal units or $2,500 in gross farm income to develop and implement nutrient management plans. An animal unit is defined as 1,000 lbs. of livestock. A sheep is 0.2 animal units. Eight animal units is equal to approximatey 40 mature sheep. The nutrient management law in Delaware is similar to Maryland's, requiring all persons who operate an animal feeding operation in excess of 8 animal units to develop and implement a nutrient management plan. Persons applying nutrients to 10 acres or more of land are also required to have a plan. Pennsylvania's nutrient management law focuses on concentrated animal feeding operations, requiring farm operations with animal densities of 2,000 lbs. or more per acre to develop and implement nutrient management plans. 3) Results of soil, plant, water, manure, or organic by-product samples. 6) Recommended nutrient rates, timing, form, and method of application including incorporation timing for the time period. The Environmental Quality Incentives Program (EQIP) was reauthorized in the 2002 Farm Bill. It provides incentive payments and shares for farmers to implement various conservation practices: animal waste/manure storage facility, composting facility, fencing, treeplanting, prescribed grazing, heavy use area protection, hayland planting, spring development, watering facility (tank or trough), filter strips, stream crossings, etc. EQIP may cost-share up to 75 percent of the costs of certain conservation practices. Any farmer engaged in livestock, crop or wood product production on eligible land may apply for EQIP. Limited resource producers and beginning farmers and ranchers may be eligible for cost-shares up to 90 percent. Approval of applications for funding is based on how well an application competes within the statewide pool of applications. Details and sign-up information is available at local NRCS offices. Late updated 22-Feb-2018 by Susan Schoenian. Copyright© 2018. Sheep 101 and 201.